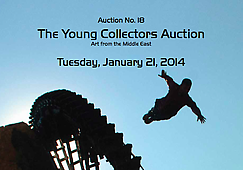 The Young Collectors Auction returns to Ayyam Gallery with an exciting lineup for collectors in 2014. Join us at the first auction of the new year on January 21, 2014 at Ayyam Gallery, Dubai (Al Quoz). The auction presents an opportunity for both the seasoned and aspiring collector to bid on an array of carefully selected works from established and emerging artists from the region. Incorporating painting, photography, limited-edition prints, sculpture and installation, over 75 lots will range in price from $2,000 to $25,000, offering a unique opportunity to invest in some of the most exciting contemporary artists working in the Middle East today. As a platform for unearthing new talent and providing international exposure for emerging and established artists, the January auction will feature silkscreens by renowned Palestinian artist Samia Halaby, sculpture and paintings by Lebanese artist Nadim Karam, paintings by Syrian artist Thaier Helal and Iranian artist Afshin Pirhashemi, photographs by Lebanese artists Lara Zankoul and Mohammad Badr, an intriguing installations by the late Egyptian artist Amal Kenawy and young Palestinian artist Abdulrahman Katanani, and limited-edition prints by Syrian Safwan Dahoul and Saudi artist Abdulnasser Gharem, who holds the record as the highest selling Gulf artist, amongst others. A catalogue detailing the artwork to be auctioned will be available in PDF format online or a hard copy can be collected from any one of Ayyam Gallery’s numerous locations. Without pretension and aimed at making the auction experience and the appreciation of art accessible and enjoyable to all, The Young Collectors Auction welcomes the public to a viewing prior to the auction with artwork lots on display and specialists on hand available to answer any questions. Both bidders and members of the public are encouraged to attend the preview and the auction. With the flexibility to bid in person or register for telephone and absentee bids online via www.ayyamgallery.com/auctions, The Young Collectors Auction allows even those abroad to participate in the auction. The first of its kind in the region, The Young Collectors Auction was launched in 2009 as part of Ayyam Gallery’s innovative approach to catering to its diverse range of clients and to introduce new regional talents to the art scene. These public sales have highlighted some of the Middle East’s most exciting figures, featuring prominent and budding artists from across the Arab world, Turkey and Iran. The Young Collectors Auction works with other Middle Eastern galleries and collectors to ensure a vast selection of painting, sculpture and photography that is at once authoritative and robust. Expanding the number and quality of lots with each edition, The Young Collectors Auction has become an essential part of the region’s acclaimed lineup of yearly art events.